West Chester Story Slam: Bad Idea! 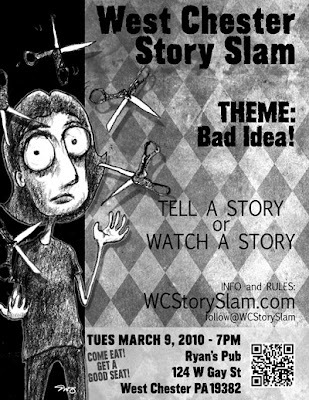 March 2010 poster promo for the West Chester Story Slam. I missed out on this month’s event due to the threat of snow. You can watch February’s Love Hurts videos here. This entry was posted in poster, story slam. Bookmark the permalink. One Response to West Chester Story Slam: Bad Idea! Perfect visual for a bad idea.